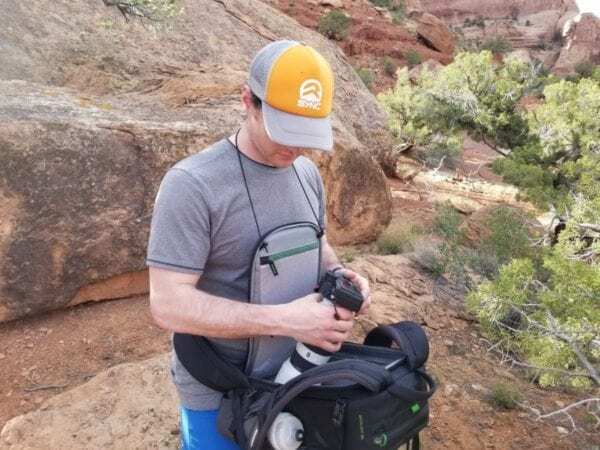 Good camera backpacks can be hard to come by because they all make various trade-offs while accomplishing the task of transporting your gear. Some sacrifice accessibility for capacity while others have poor load carrying straps and waist belts. MindShift Gear, Think Tank Photo’s outdoor-oriented sister company attempts to alleviate this with a range of versatile packs. 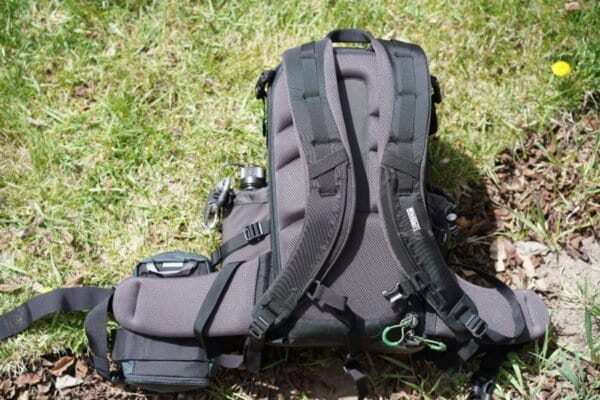 This will be a review of the new MindShift Gear BackLight 18L camera backpack. With its back panel flap, the BackLight 18L is designed to allow access to your cameras and lenses without taking the bag off. 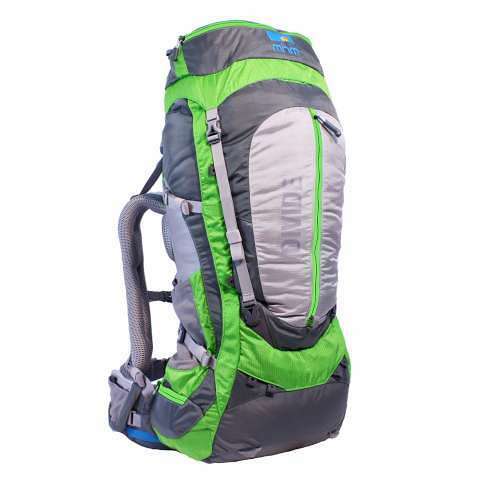 At 18L, it’s sized to carry a solid amount of gear on a hike or traveling around while still having room for non-photography essentials (5L to be precise). Read below for our review. The BackLight 18L is somewhere between utilitarian and comfortable when it comes to its strap design. The shoulder straps are decently padded and have a nice ergonomic curve to them, keeping them from chafing in uncomfortable ways. There is no torso height adjustment and I found I had to loosen the shoulder straps a fair amount to get the hip belt to sit properly on my 6’1″ body. I have an exceptionally long torso though, so it’s important to try it out yourself. A nice sternum strap with an elastic section is easily adjustable by sliding up or down a channel. The hipbelt on the BackLight 18L has good padding and a subtle built-in curve to it. 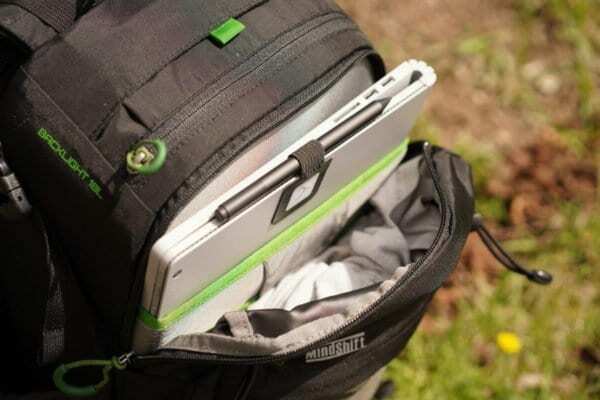 When tightened, I feel it keeps the pack in a good position on your back and prevents it from moving around too much. However, I wish that there were load stabilizers to help stabilize the bag further. The straps are of the inward pulling variety and I always find those preferable for quick adjustments. The backpanel has a thick, mesh-covered padding to it and a few channels for air flow. For a non-framed backpanel, the BackLight 18L does a decent job of reducing sweating a bit. I would prefer more distinct padding at the lumbar area but it would probably add bulk and weight. 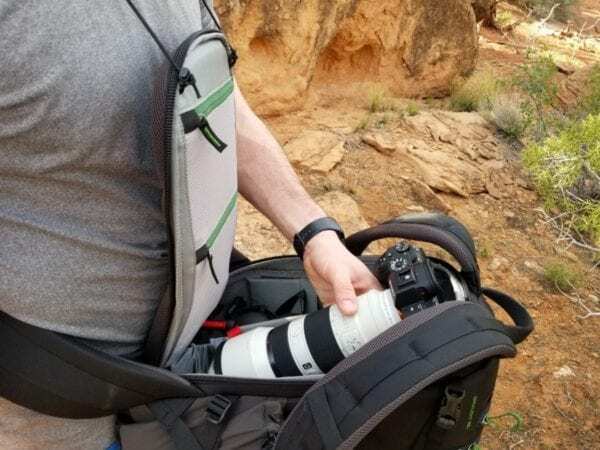 Overall, the load carrying experience with this bag is pretty good for a camera backpack and about average for a non-camera backpack. The problem is that backpanel access (the key feature of the BackLight 18L) means that the straps have to be attached to a panel that is zippered to the rest of the bag. This approach is simply not the best for load stability. 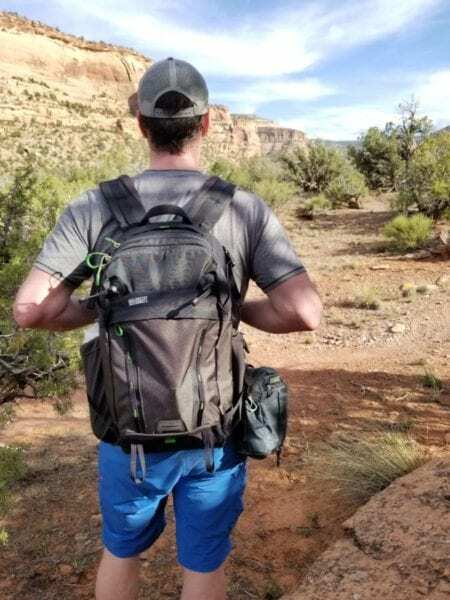 When you hike, it almost feels like the bag is moving independently of the straps you’re wearing. 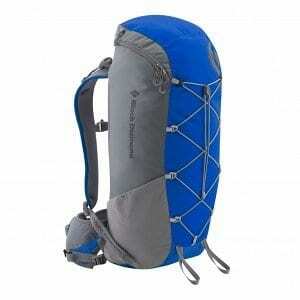 The straps keep the pack in place but it is definitely not as comfortable as a more traditional modern hiking pack. There are compression straps on the side of the pack but these are best used for attaching things to the sides, since the rigid nature of the camera compartment obviously prevents any load compression. 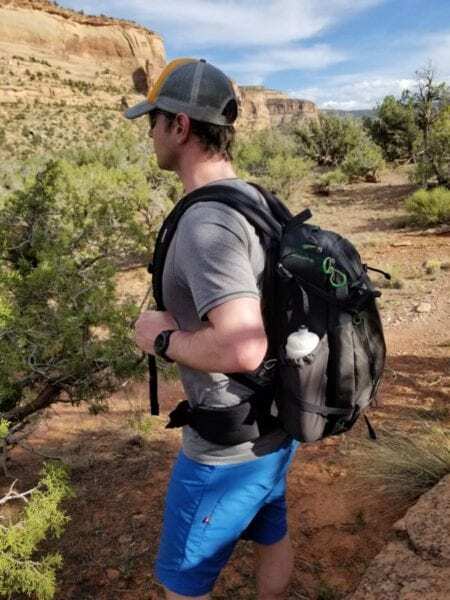 On a shorter hike through Colorado National Monument, I found that the BackLight 18L perfectly acceptable from a comfort standpoint. I might not feel the same with a long day on the trail. However, I normally don’t bring this amount of camera gear on a day like that. At the front side of the MindShift Gear BackLight 18L is one large pocket and a smaller zippered pocket on the front flap. All in, this provides about 5L of space for extra items not stored in the camera compartment. This is a perfect spot to throw a layer, pair of gloves, a hat, and a little food. I appreciated that the zipper goes all the way down the side while having a piece of fabric that keeps items from falling out. Additionally, there is a mildly padded laptop sleeve in this compartment. It is designed to accommodate a 13″ computer as well as a 10″ inch tablet. My 13.5″ Microsoft Surface Book 2 JUST barely fit in there but it was a tight squeeze so consider this if computer carrying is an important function for you with a bag this size. Also, there are a couple of slots for miscellaneous items and a few pens in this space. Rounding out the exterior pockets is a top zippered pocket that could hold the included rain cover or some small accessories or snacks. 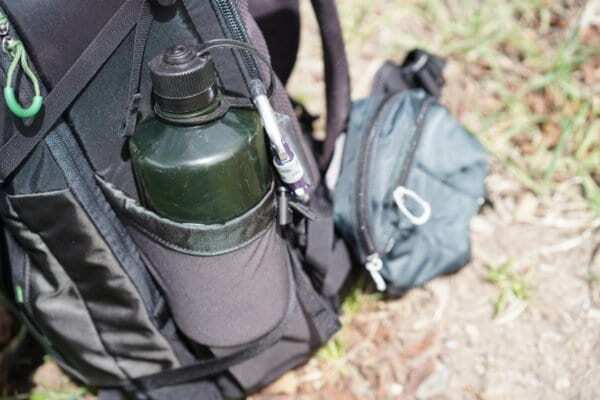 I’m a stickler about water bottle holders and thankfully the BackLight 18L didn’t disappoint me in this review. 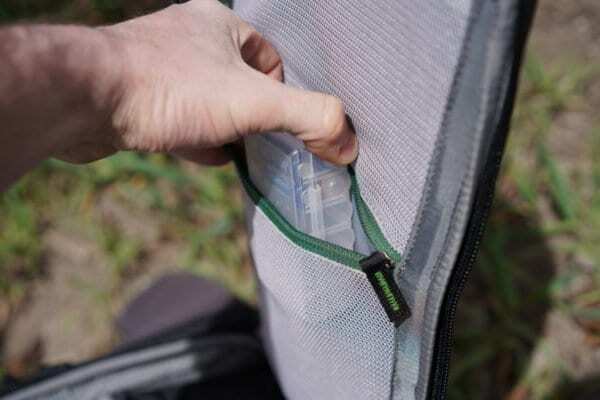 The pack has two stretch pockets that accommodate everything from small bottles to 1 liter Nalgenes. A drawcord keeps the bottle from falling out when using smaller bottles. My Nalgene was easy enough to access and return to the pack as I hiked. As you can see, you can fit a substantial amount of gear in this pack and it should cover many photography scenarios. For a landscape and adventure photographer, it’s more than enough to get the job done and have backups in case of issues. Like all Think Tank and MindShift Gear camera bags, you are given a nice collection of dividers that can be arranged in a number of varied ways. You should have no problem setting up the camera compartment to fit your needs. The ‘snake’ divider included with the BackLight 18L is great for setting up the classic dual cameras with 24-70 and 70-200 lenses attached. The dividers use a strong velcro that stays in place when needed but can be easily adjusted. MindShift Gear has pictures on their website of various configurations of gear with different brands including Nikon, Canon, and Sony. While you can see from those photos that DSLRs can definitely fit in the bag, I found it to be a perfect match to the smaller sizes of mirrorless cameras and lenses from brands like Sony and Fuji. However, with the very small size of Fuji glass, you will need to get creative to make sure the lenses don’t float around too much. I did find that when I had my vertical battery grip attached to my camera, the depth of the BackLight 18L made it a bit of a tight fit. 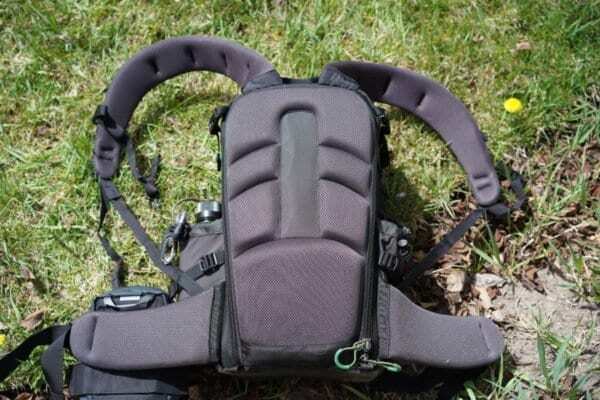 It had no problem closing but when the camera and grip were loaded in the lower section of the pack, you could feel an unevenness on your back. Putting it in the upper section reduces this issue. One of the key features of the MindShift Gear BackLight 18L pack is the ability to access the camera compartment without putting the bag on the ground. The panel that sits against your back is the main access point and this allows you to spin the bag with the belt strap attached and open it up in front of you. Many camera bags put the access on the front of pack and you have to take the bag completely off, place it on a surface, open it up, get your gear, close it, and put it all back on. For gear changes on the go, the BackLight 18L’s rear panel access is a big time saver and helps to prevent getting your gear dirty from snow, water, mud, etc. 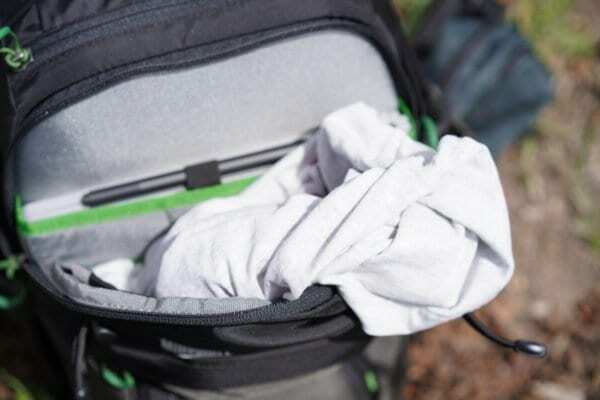 I love the idea of this and it is really important for hikers and skiers who want to keep their bag our of the dirt and snow. While I found it worked pretty well, it isn’t a perfect system. The issue is that the hip belt needs to be loose enough to spin freely to the front. If it is that loose, it is probably not tightened enough for proper load distribution. What this means is that you end up with a small extra step of loosening the hip belt before spinning it and having to tighten it again when you put it back. 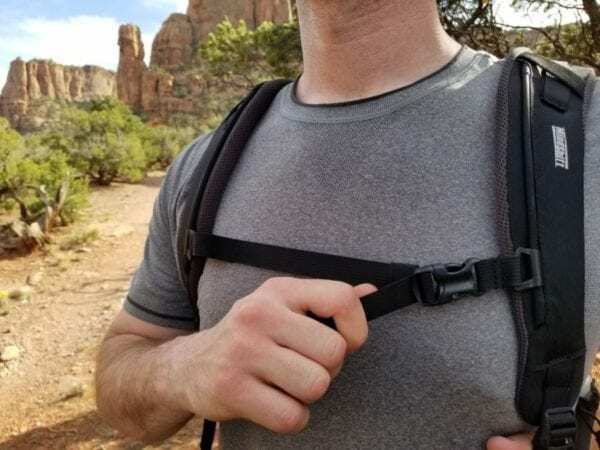 A nice feature to note is the inclusion of an adjustable elastic band that you can put around your neck to keep the backpanel from closing as you grab gear or change lenses. 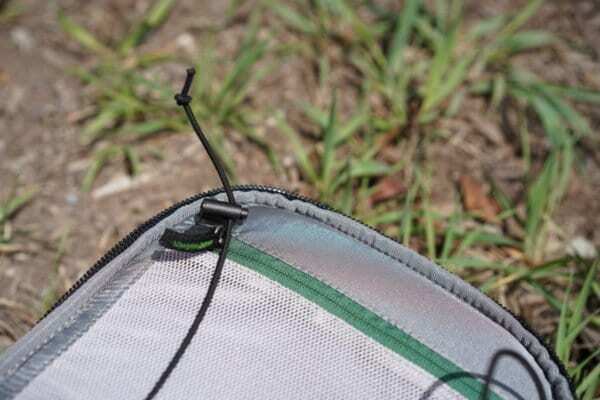 Unfortunately, this strap has a tendency to get in the way of the zipper and you have to be aware of it when you close the panel. 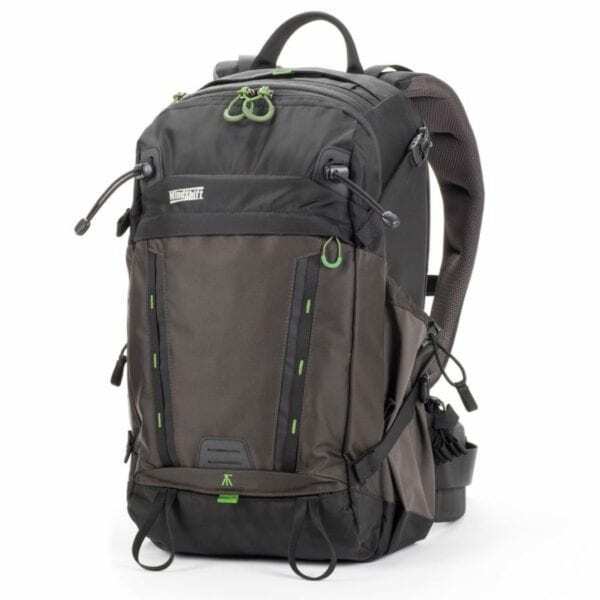 Regular readers of this site will know I am a huge fan of MindShift Gear and their sister company Think Tank Photo and the BackLight 18L is yet another reason. The camera backpack is well designed, extremely well built, has a versatile interior and enough space for non-photography items on a day-hike. 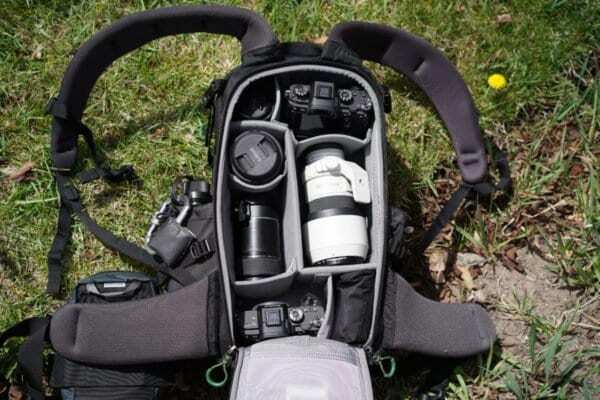 I particularly like the ability to access the camera compartment without having to put the bag on the ground as this is important for adventurous photographers. The suspension system isn’t perfect but it is comfortable enough for typical activities and as good as similar offerings from other companies. At $199, the BackLight 18L camera backpack is an investment but that comes with MindShift Gear’s excellent build-quality and lifetime guarantee. Because of this, I give it my full recommendation for those looking at mid size camera backpacks for the outdoors.